It's like having a barista in your kitchen. Or your campsite. For their first road trip in California, Blue Bottle Assistant Store Manager Corey Lenko and his girlfriend, Lauren, got back to basics: They packed their camping gear, turned off their phones, and dug up some old-school paper maps. 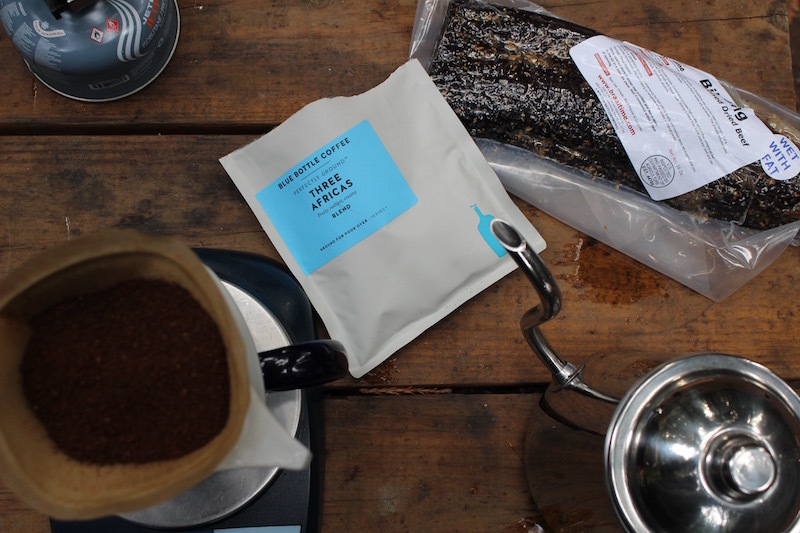 Because they wanted to rough it without sacrificing their morning cup of coffee, they also brought with them a Voyager Pack of Blue Bottle Perfectly Ground. After stopping at the Palo Alto cafe for a final taste of civilization, they hit iconic Highway 1, where, with the help of analog navigation, they made their way down the coastline to Big Sur's Ventana Campground. On their way, they stopped at Pie Ranch, a Pescadero farm, for duck eggs, fresh goat milk, and homemade pie. "We're both huge foodies at heart," said Corey. They didn't forget to thank the locals for their hospitality. After a night of stargazing, they began the next morning with twin cups of Three Africas. With the help of a camping stove and pouring kettle, they were well on their way to recreating their morning routine in the redwoods. Naturally, they enjoyed their drinks with the savory staples they picked up the day before. "The coffees were absolutely delicious with a touch of goat's milk. And some fried duck eggs, bacon, and South African Biltong from Braaitime," said Corey. Over the course of the day, they also made pour overs with Honduras Las Flores Cristobal Hernandez and Bella Donovan coffees. They explored Big Sur, hiked the shoreline of Point Lobos, and befriended sea otters in Monterey—all without having to resort to gas station coffee. Not once.